Discover better handling and smoother towing experiences. I often relay strong messages in columns that it’s ideal and important for tow vehicles and trailers to have a low centre of gravity. 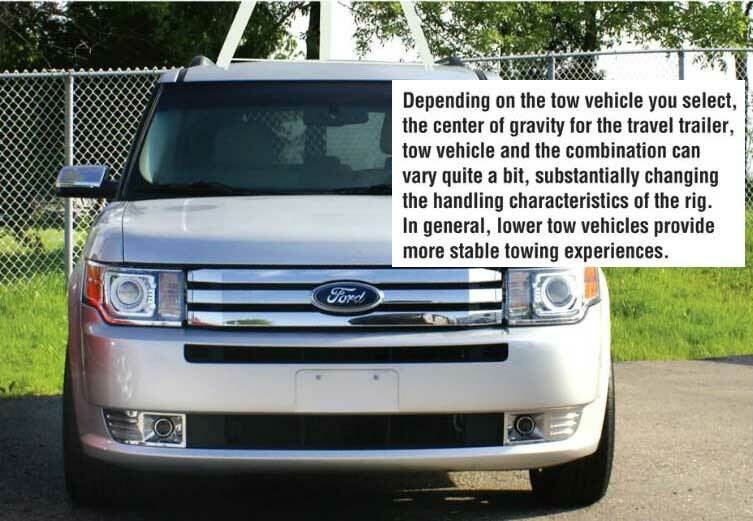 So, for this column, I thought I would emphasize a little more on the importance of this matter and how it affects your overall towing experience when traveling this season. When a vehicle’s centre of gravity is higher, you can instinctively understand that it will roll over easier than a vehicle with a low centre of gravity. However, there is more to this than just that. With a higher centre of gravity, more weight is also transferred to the outside tires in turns. Thus, the front brakes are forced to do more of the braking in a sudden stop. This also causes the vehicle to go out of balance easier. In performance cars, centre of gravity is considered extremely important. For example, in a BMW M3 the roof is expensive carbon fibre as it saves 40 pounds at the top of the car. Porsche spent millions to design a multi-plate clutch because the reduced diameter allowed them to place the engine and transmission an inch-and-a-half lower in the car. You could say “I don’t drive an M3 or a Porsche at the limits so why worry about centre of gravity?” True, but should you ever find yourself in an emergency situation trying to avoid an accident, you will suddenly become very aware of your vehicle’s centre of gravity. For many people, a large, high and heavy vehicle feels safer but in accidents they can be unpredictable. If you have to make a sudden emergency lane change or need to drive off the road to avoid an accident, a vehicle with a low centre of gravity is many times more likely to keep you upright, maintain traction and stay in control. Keep in mind, however, that a high centre of gravity also has an impact in much tamer conditions. Sometimes, the best way to think about this is to take it to an extreme. If you had a 2,000-pound block of lead on top of an 8’ pole coming out of your car, your entire driving experience would be all about controlling that mass. If you were to hit a large pot hole with the right wheels, causing the weight to lean over to the right, you would need to steer to the right to keep the car under the weight. If you steer too quickly, this would cause the weight to swing back to the left and applying the brakes would cause the entire vehicle’s weight to go to the front wheels; inviting the car to spin at the rear. "With a higher centre of gravity, a stiffer, more controlled, suspension would be required to get the same amount of control." If this case, the suspension would have to be extremely firm or the car would just fall over to the suspension stops on one side or the other. The ride, therefore, would be brutally stiff. If the weight was lowered to only on top of the roof, the car would be drivable but still quite difficult to manage. The higher the centre of gravity, the more the vehicle will be affected by bumps and dips. It would also require more steering correction. With a higher centre of gravity, a stiffer, more controlled, suspension would be required to get the same amount of control. In other words, you are using much of your handling equity just to control the higher centre of gravity even before you begin to control the vehicle. In some vehicle specifications, there’s a trade off but there is no positive offset to having a high centre of gravity. By necessity, some vehicles need to have a high centre of gravity. For example, it would be tough to go off-road in a low-profile Jeep. Still, most people have no need for high ground clearance but styling and perception sell vehicles – especially, in trucks and SUV’s. A higher vehicle implies that it’s tougher and safer (even though it isn’t). One of our customers tows his Airstream with a very nicely restored 1969 Chevy half-ton. This truck does the same job as a new and very high half-ton. Sitting as high as they do, current trucks are not nearly as user-friendly as they push far more air and do not handle as well. A designer at one of the car companies showed me a picture of a low profile sport half-ton they were considering but he said when they did their focus groups, virtually no one wanted it. "One way to help offset a high centre of gravity is to have a wider track and wider suspension stance on the vehicle." One way to help offset a high centre of gravity is to have a wider track and wider suspension stance on the vehicle. Independent suspension is a huge asset on high vehicles as the suspension stance is the same width as the track, while on vehicles with live axles, the suspension stance is the width between springs. Track and stance can be measured but you can’t easily get an exact measurement of centre of gravity. A good way to compare is by measuring the distance from the ground to the rocker panel. This is a better indicator than overall height. Obviously, if the vehicle comes with a ladder the centre of gravity is likely not very low. One test that is somewhat revealing is to check the vehicles roll stability. If you open a door, grab the edge of the roof and then try and roll the vehicle side to side. You will be amazed at how easily you can roll some vehicles several inches side to side. I often hear people say they like the visibility of sitting higher. One type of vehicle that combines a reasonably low centre of gravity with tall visibility is a front-wheel drive van. The sitting position is high but the centre of gravity is still quite low. As an added bonus, the load floor height is relatively low as well. The stance is as wide as most full-size trucks. In many vehicle types, there is a wide variance in centre of gravity between different makes and models. For towing fifth wheels, we use a two-wheel drive ¾-ton Ram pickup because it has a lower centre of gravity. Many RVs (motorized and towables) now have a considerably higher centre of gravity than they had in the past thanks to slide-out rooms that have to clear the top of the tires. Trailers and fifth-wheels are assisted with this by their wider stance. 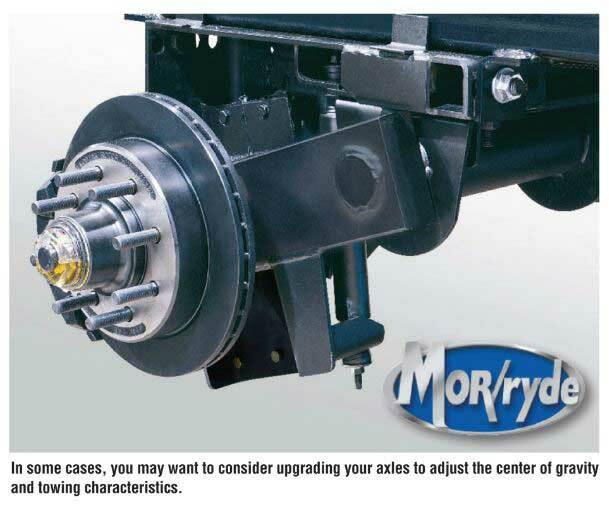 Independent suspension helps a trailer or fifth wheel just as it does on a tow vehicle. A good measurement to compare on trailers is the floor height. Again, this is more important than overall height. On a trailer you can easily test the roll stiffness as you can on a tow vehicle. Simply wind up the stabilizing jacks, grab the door handle and see how easily you can roll it side to side. You can test a fifth wheel the same way but it will need to be connected to a truck, not sitting on the landing gear. Centre of gravity is not the only specification to look at when choosing a vehicle. It’s not one to totally ignore either. If you take it into account, you’ll find yourself with a safer, better handling, and smoother riding combination. Originally published in RV Lifestyle, Volume 43, No. 3.